Neutrinos are particle in the size of electrons, but without charge. We know that they have mass, but we haven’t measured it yet. Although they are everywhere (our bodies are hit by about 100 trillion neutrinos every second), neutrinos cannot be detected since they rarely interact with matter. Scientists now managed to spot one of them and trace its origin, a blazar! 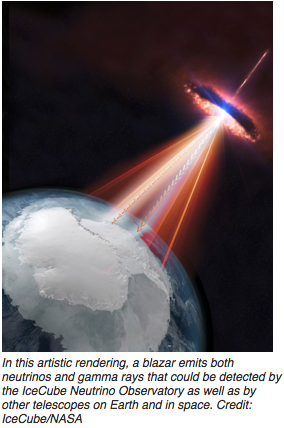 The detection was made by the IceCube Neutrino Observatory near the South Pole in September. IceCube consists of 86 detectors buried in the ice of Antarctic (2500m deep!!). These detectors traced the path of the neutrino so clear that scientists managed to follow its journey backwards across the universe. Then other telescopes around the world turned to that direction, trying to find a cosmic event that could have given birth to the detected neutrino. And they found! It was a blazar located 3 billion light years away from us! The discovery of the origin of the neutrino was made possible because neutrinos, unlike any other high energy particles, can travel large distances in straight lines. This is because neutrinos have no charge. Scientists are also trying to detect lower energy neutrinos originated by supernova explosion in the Milky Way. A network has been setup for that purpose. The previous supernova as observed in 1987, before neutrino detectors come to existence. A new era of astronomy commences, the era of multi messenger astronomy, during which data will be combined from different energies and particles, like light photons, neutrinos and gravitational waves. This will open a new window to understand the physics that governs our universe.